12:37 a.m. — One man was arrested on a warrant and another issued a summons for possession of marijuana drug paraphernalia in the 600 block of Harding Way East. 10:56 a.m. — Officers assisted the county dog warden with a dog that that allegedly bit a Center Street resident. 1:21 p.m. — A welfare check on children was attempted in the 900 block of Smith Street but the residence is unoccupied. 3:55 p.m. — A non-injury accident was investigated involving a police cruiser in the 100 block of South East Street. 10:38 p.m. — A report of a vehicle with several people in it in a driveway on McDonald Avenue was investigated. 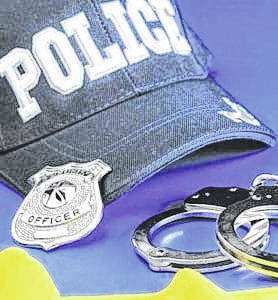 One person was issued a citation for possession of marijuana and drug paraphernalia and received a warning for corrupting a minor with drugs. 1:40 a.m. — A domestic dispute was investigated in the 400 block of Libby Lane. 6:09 a.m. — A report of a suspicious man in the 400 block of Harding Way East was investigated. 6:20 a.m. — A citation was issued to a man who ran into fire hydrant in the 700 block of Boyd Boulevard. 2:05 p.m. — Officers assisted EMS personnel and the county coroner with an unresponsive person in the 700 block of Harding Way East. 10:03 a.m. — A report of two suspicious people entering the old Sautter building in the 900 block of Harding Way East. 4:43 p.m. — An employee at Bellstores, 902 Portland Way North, reported a motorist stole gasoline. 6 p.m. — A report of a breaking and entering of a garage in the 400 block of Grand Street was investigated. A man was arrested for operating a vehicle under the influence and driving under suspension. 4:56 p.m. — Officers were called to a residence in the 100 block of South Pierce Street for an overdose. One person was arrested for drug possession and taken to the Crawford County Justice Center. 11:22 a.m. — An Eighth Avenue resident reported the violation of a civil protection order. 6:30 p.m. — A 20-year-old from Mansfield was arrested for operating a vehicle under the influence, failure to control and expired tags in the 700 block of Portland Way North. 9:14 p.m. — A woman was warned for trespassing at a residence in the 100 block of East Church Street. 1:23 a.m. — Officers assisted the Crawford County Sheriff’s Office in searching for two people who ran from the scene of an accident on Kline Road in Polk Township. 2:21 a.m. — A report of a disturbance in the 200 block of Libby Lane was investigated. 3:20 a.m. — A man was cited for possession of drug paraphernalia during a traffic stop on North Liberty Street. 1:04 p.m. — A man was issued a citation for expired tags on Public Square. He was also issued a summons for possession of marijuana and marijuana drug paraphernalia. 4:05 p.m. — One person was issued a summons for possession of drugs and one person detained on Harding Way East. 7:27 p.m. — Owen Kiss was issued a citation for speeding in the 600 block of South Boston Street. 11:11 p.m. — Officers investigated an injury accident in the 700 block of Portland Way North and one person was arrested. 1 p.m. — A bicycle found by the city’s street department in the 100 block of Portland Way North was turned over to officers. 4:34 p.m. — A South Market Street resident reported tools stolen from a truck. 5 p.m. — A customer of Galion Building and Loan reported someone attempted to steal money from their bank account. 7:16 p.m. — A juvenile was taken into custody for domestic violence after officers were called to a residence in the 700 block of East Church Street. 12:51 a.m. — A report of a suspicious vehicle in the 300 block of Harding Way West was investigated. 1:19 a.m. — A report of a suspicious vehicle in the 700 block of Harding Way East was investigated. 9:51 a.m. — A Buckeye Road resident reported a case of fraud. 10:06 a.m. — A report of a breaking and entering of a garage at a residence in the 400 block of Euclid Avenue was investigated. A motorcycle lift and several tools were reported stolen. A glove left at the scene was taken as evidence. 12:05 p.m. — Officers assisted Children Services personnel in the 500 block of East Church Street. 2:34 p.m. — A 36-year-old Galion man was arrested on a misdemeanor warrant in the 500 block of Richardson Avenue. 4:17 p.m. — A report of a juvenile assaulted on a school bus by another student was investigated in the 1400 block of Baehr Street. 11:42 p.m. — A report of loud music in the 400 block of Third Avenue was investigated and two people were issued warnings.